Joining a local beekeeping club provides lots of support, information and education….all making you a better beekeeper. The West Sound Beekeepers Association each year on bee arrival day puts on demonstrations throughout the day. This makes it easier for newer beekeepers to understand the process of moving their new packages of bees into their new home. A 3 pound package of bees contains about 10,000 bees and one queen. You will find other bee package installation videos here and here. David Mackovjak does a great job not only installing this package of bees but also fielding questions from the onlookers. A new beekeeping season is upon us. 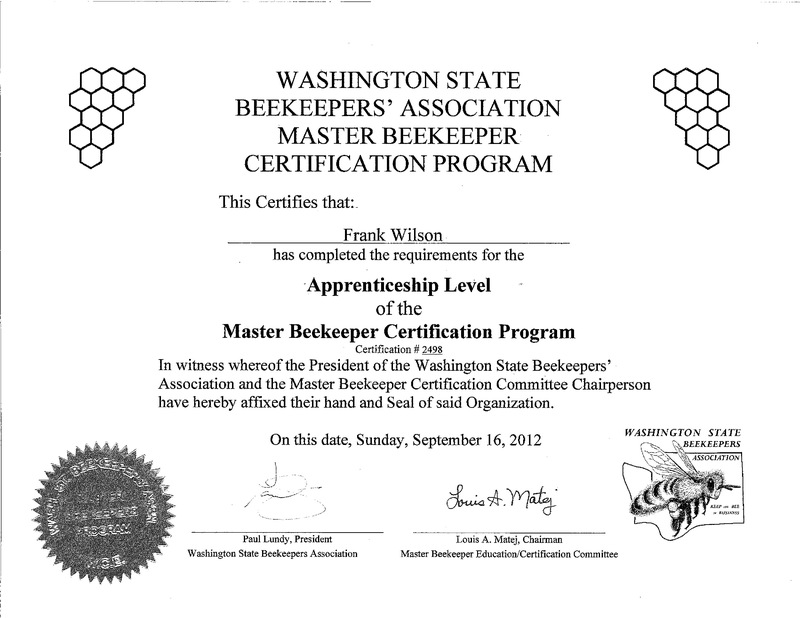 Last year at this time I was just starting the beeginners beekeeping class. I had done a lot of reading, a lot of asking and had no real idea the adventure I was stepping into. Now, a year later our club is once again assembling those folks who would like to learn about this fascinating hobby. This was probably one of the most important steps I took to prepare myself for beekeeping. Not only did I learn a lot about keeping bees but almost as important is that I was able to meet others who have been where I was. Our local beekeeping club, West Sound Beekeepers Association, puts on the class each year. We covered everything a new beekeeper needs to get started; equipment, bees, bee anatomy, bee pests, different types of hives, swarming, working with the bees, inspecting your hives and growing your apiary. This is also the launching point for becoming a master beekeeper. Above is my apprentice certificate, I’ve started work on the journeyman level and finally…after many years and lots of knowledge you can become a Master Beekeeper. Additionally the club offers advanced classes, mentors, and specialized equipment to check out. Our club also has an extensive library of books and DVDs that we have either purchased or have been donated to us by our members…..a real treasure trove of information. This should be one of your first steps, finding and joining your local bee club. If you can’t find one locally contact your state beekeeping association, they will have a list of local clubs in your area. In my area that would be the Washington State Beekeepers Association or WSBA. This was me a year ago. I was chomping at the bit to get my first bees. This year I’m a little wiser and have the experience of one season. So much more to learn and regardless of your goals, to be a back yard beekeeper with a hive or two….or have dreams of a commercial operation….we all start here……at the beginning, what kind of bees do I buy, what kind of equipment do I use and where do I put them. And soooooo much more to learn; grafting and raising queens, splitting a hive, catching a swarm, and expanding my apiary……..Its going to be a great beekeeping season! !